The future is just the past disguised as the present.. In the summer between high school and college my buddies and I decided to celebrate our high school graduation by taking a road trip to New Orleans. We selected New Orleans for because in Louisiana the drinking age was 18. At that time and it was legal to drink beer, wine, and liquor. The legal age in Texas was 21, so we were all looking forward to this new experience. I still fondly remember arriving and walking into a bar in the French Quarter and ordering a mixed drink. The Vietnam War was at its peak, and within 18 months, eight of my friends were serving in the US Navy. In addition to heading to college, we all were just a couple of months shy of voting in our first presidential election. While we all were just 18 or 19 years old, we felt we had arrived at adulthood. Fueled by the coming of age of the boomer generation, along with the war, almost all the states lowered their legal drinking age to 18, even the state of Texas lowered their legal age of consumption. In the early 1980s, the legal age was still 18 when I owned the Schlitz distributorship. The territory included South Padre Island, a primary destination for spring breakers. With Texas having 18 as the legal drinking age, almost all college students were able to drink. This made the month of March my biggest volume month of the year. With the war long over, the federal government decided to withhold highway funding to states that retained their legal age for alcohol consumption under the age of 21. It took some time, but it was not long before all the states, including Louisiana, raised their legal age to 21. Sales volume at spring break that first year was a nightmare. It turned into an economic disaster for many industries including motels, restaurants, and gas stations, all feeling the effects of raising the legal drinking age. The states also felt the crunch as millions were lost in tax dollars. Now, 30 years later, we are seeing the rapid growth of craft beers, mostly fueled by the Millennials (the always connected generation), but we are also seeing the total beer industry continue to decline in overall volume. Aging boomers, the competition from the wine and spirits side, pressure from the anti-alcohol groups, and other areas including the economy, have all contributed to the industries’ decline. The industry is split between the crafts, and their goals, which do not fit into what the NBWA and what its members are willing to do. The BA and the BI have bills in Congress, which translates to the members as a split industry. Therefore, neither one will get passed. So the question is, can the industry find any common ground on which all sides can agree on, and work to help grow the overall industry? The Millennials, just as the Boomers, are changing the alcoholic industry and with 20+ million more under the LDA, will continue to do so for some time. The Millennials could be the generation to jump start the growth once again and it might entail lowering the legal age for just beer. With a united industry, the change could happen. Remember, the future is just the past disguised as the present. How about never….is never good for you? 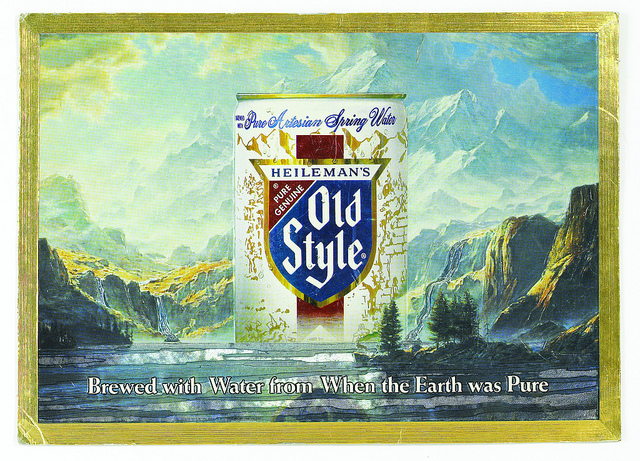 By the 1980s, G. Heileman Brewing Co. had grown into the third largest brewing company in the US. The business model enabled Heileman to own and market a number of small but successful regional brands. The breweries’ anchor brand was Old Style, the number one selling beer in the Chicago market and surrounding states. Due to the large number of regional brands Heileman owned, it was not unusual to have multiple distributors in one market. As a distributor, I was responsible for Special Export, Malt Duck, and Mickey’s, and I competed against other Heileman distributors. In fact, once we learned Heileman was expanding a new brand into the market, all the distributors made presentations to the brewery. 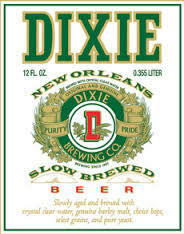 The franchise laws in Texas at that time enabled a breweries’ to have multiple distributors. Heineken had bought Van Munching, their importer, in 1991, and began a slow but determined model to move distribution of Heineken to beer houses. Since WWII, distribution of Heineken had been handled predominately through Wine and Spirit distributors. The rapid success of Corona, which flew past Heineken to become the number one import, seemed to wake up the brewery. At this time, dueling distributors in Texas was legal. With Glazers as Heineken’s Texas distributor, Heineken was looking to ramp up on-premise distribution. Glazer’s business model did not fit with Heineken’s business model, so Heineken dueled the brand with Glazers permission. The result being that on-premise would be serviced by the Miller distributors and Glazers would service the off-premise. This action by Heineken alarmed the beer wholesalers who began to focus on changing the franchise laws to exclude dueling and to allow line extensions and brands to be handled by the existing wholesaler. The wholesalers did, in fact, modify the state franchise laws to include these provisions. However, the Heineken and Glazers dueling model was grandfathered to allow these two companies to continue doing business under their existing model. The Corona success continued. Corona sales, in fact, were accelerating and when the Julius Schepps W&S Company sold their beer portfolio to the Miller network in 1997, it was one of the largest W&S companies to have the Modelo brands. In in Dallas alone, 247 new Corona 2/12 pack placements in c-stores were made by the new wholesaler in the first month. This did not go unnoticed by Heineken. In 1999, Heineken had enough, and in spite of the state franchise laws, terminated Glazers after attempting to get Glazers to sell the brand. As expected, lawsuits were filed and hundreds of thousands of dollars were spent in legal action. An agreement was reached years later between the two companies which allowed Heineken to stay in the Miller beer network. Fast forward to 2014, and nothing has changed as crafts now have replaced “Heineken” as they, too, are struggling with franchise statues with wholesalers’ attempts to move brands to what they perceive as a better alternative to their current situation. Thirty years have passed since the dueling of the G. Heileman brands, and 25 years have passed since Heineken’s charge through the US. The question the industry should really ask itself about changing and challenging franchise laws is: How about never……is never good for you? Above-the-line marketing also focused on print ads using famous people, usually athletes or movie stars. Sports marketing consisted of professional ballparks with billboards, which can still be seen in old movies. When Philip Morris purchased the Miller Brewing Co., PM employed their refined marketing expertise which had been developed through years of selling cigarettes. 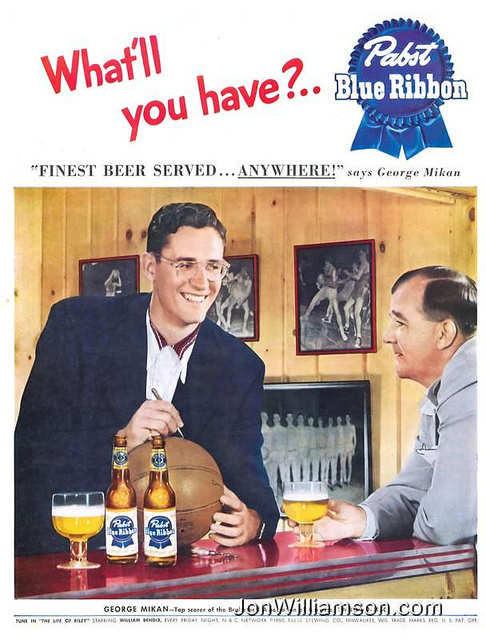 Using Miller Lite, they went after sporting venues whenever possible. This action by Miller woke up Augie Busch III, and AB aggressively went after young MBA marketing professionals and dramatically increased ATL spending. Schlitz, still about 10 years from imploding, followed suit. Marketing in the beer world had changed! The next great shift in beer marketing took place with the advent of the internet. Much of craft beers’ success today must be attributed to the internet which the consumer employs to discover the various brands and styles of beers available. Until the advent of the internet, off premise chains were dominated by the major brands which controlled what products went into the cold box. In other words, consumers had limited choices. The internet changed the scope of business and then, with the invention of social media, the world of beer marketing changed even further. Dallas’s life style magazine, D Magazine, recently named the top 30 craft beers for 2014. First on the list was a brand made by Grapevine Brewing Co., who only started selling beer in November. The same brewery had another brand listed 12th on the list of best in rankings. Within 24 hours, Grapevine Brewing had announced these results to all their followers on e-newsletter, Facebook, and multiple other forms of social media. Prior to the internet, it would have taken Grapevine Brewery weeks to get this news to the public. Press releases, display ads, and space purchased in print or on the air could not have been released overnight! And the costs associated with public relations or an advertising firm had to be included. So the question is, just how is today’s social media classified in a true marketing planning? Is it ATL or BTL? Two key marketing and advertising professionals commented that there was not a clear definition of classifying social media. Warsteiner, for example, managed Facebook from their corporate offices. In this situation, this would be ATL because of mass media. If managed locally, than perhaps you would consider it to be BTL marketing. Or is all digital mass media ATL? Would Twitter be considered BTL marketing? It is clear that traditional ATL marketing will continue focusing on professional and college sports, supported by digital marketing. It all boils down to the fact that if you change the way you look at things, then things you look at change! The Texas Brewing Company was reincarnated in 1992 in Dallas by a highly successful oil wildcatter who was looking for something new and different to create. Originally located in Ft. Worth, the Texas Brewing Co., during its peak, grew to a 250K bbls. capacity before closing during prohibition. The oil baron who revitalized the company had discovered that the name and beer labels were available, so he trademarked them and built a small microbrewery in downtown Dallas. He began brewing and packaging, but made many mistakes, by far the biggest of which was the liquid he put produced, which at best, was bad. The company never got off the ground and eventually sold. The new buyer kept the name Texas Brewing Co., and retained Stroh Brewing Co. in Longview to brew the beer. Obviously his liquid was very good, but once again, poor decision making going to market resulted in a second closing within the first year in business. Ten years later, a new craft brewer started in Ft. Worth called Texas Beer and Soda Co. The brew master was experienced, but once they started brewing and selling product, complaints began to surface regarding the quality of the liquid. Initially, the blame was placed on inferior crowns which caused the beer to oxidize. The bad beer was destroyed and a new batch replaced the old. But once again, the liquid was of poor quality. Bacteria was discovered in the filler which caused the liquid to go bad, however, by the time this discovery was made, it was too late. The brewery was soon closed. Two weeks ago, I received a heads-up alert from a Gusto Club member of the old Schlitz employees in Texas, that a Milwaukee public TV station was doing a show on the Schlitz Brewing Co. The show, I Remember, featured stories on companies and people from Milwaukee’s past. 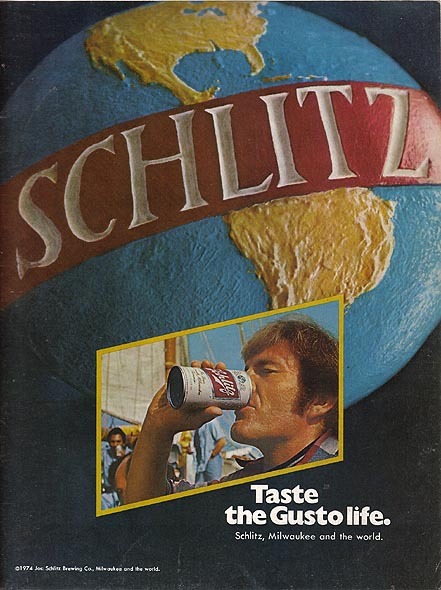 In this segment, the show’s guest was Peter Uihlein, a family member that ran Schlitz, and who had worked with the company for years. The story explains the history of the brewery, how they impacted the city of Milwaukee, and what happened to cause the death of a 24 million bbl. company. Simply put, if you cut corners and put out an inferior liquid, you will fail. Below you will find the story. Despite the fact that the story is 26 minutes in length, viewing it is worth the time. In fact, all craft brewers should see this clip simply for the purpose that the distributor was referring; there are no short cuts to success in the beer business.